We spent the morning at White Sands National Monument. It was a great quiet place with few visitors this time of year. We had visits from 3 different dogs, which was nice. New Mexico is one of those really dog-friendly places. Wish Texas was more that way. It eased the missing of my Grace & Clovis. Got a little wet sand and slobber on me, made me almost feel at home. We had the added treat that the north sides of most every dune was still covered with a recent snow. You think the “white sand” is really white until you see it covered with snow. It quickly appears more ecru than white. 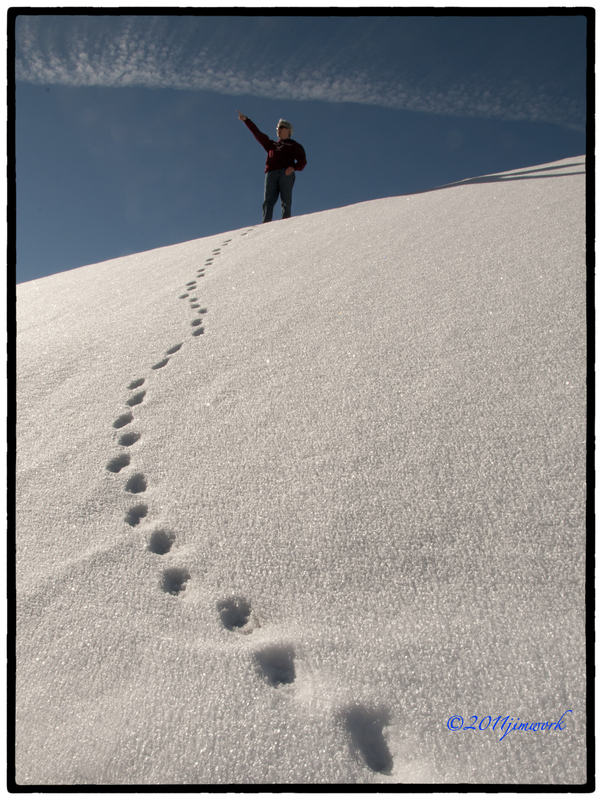 We came across this one snow-covered dune that had a great line of tracks going up the side all the way to the top. Susan walked around them and up to the top. A great little wisp of a line of clouds was provided by the Master completing the scene. All I had to do was push a button and walk with a smile back to the car…..kewl beans. great shot, love the texture in the snow. Almost looks like you used a polariser. Hey…..that’s my girl Susan at the top of that dune!!!! Very cool picture, Jim! Hope you two are having a fantastic time……happy new year…..love you guys!!!! Hope you’re enjoying your trip! Awesome shot!